Figure 1. Columns of various microalgae cultured for the adult and young Olympia oysters in the MLML aquarium room. In time for Halloween, Moss Landing Marine Laboratories (MLML) has teamed up with the Elkhorn Slough National Research Reserve (ESNERR) with funding from the Anthropocene Institute to place about 19,000 young native Olympia Oysters into the slough. Kerstin Wasson, who is the Research Coordinator for the ESNERR, reported that only about 4,000 Olympia Oysters currently survive in Elkhorn Slough, thus the goal of the project was to try and rebuild the population so that it could be self-sustaining. Staff from ESNERR removed about 50 adults from the slough at various locations to account for possible location variability. 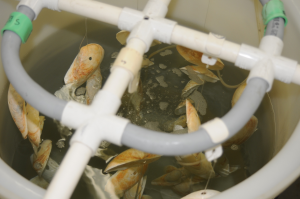 These adults were used as the brood stock by MLML researchers and students that stimulated spawning by regulating temperature in a systematic fashion. The young oysters were then placed in temperature-controlled tanks with vertically arranged shells to allow the larval oysters a place to attach and start growing (Figures 1 & 2). 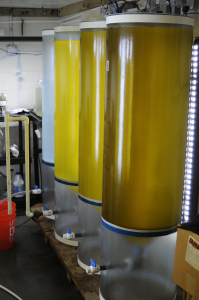 The newly settled oysters were then fed various microalgae that were cultured in a new microalgae culture room at MLML (Figure 3). 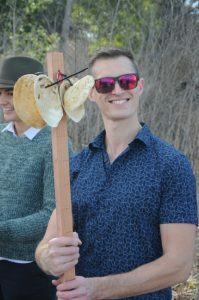 Once ready to be transplanted into Elkhorn Slough, a group of volunteers gathered on 23 October 2018 to place the shells with the young oysters attached (Figures 4 & 5). Kerstin and her team will continue to monitor the new oysters to see how the well they survive. This was an excellent example of collaboration among local researchers, and the use of aquaculture practices to restore native populations. Read more at the post by CA Sea Grant. 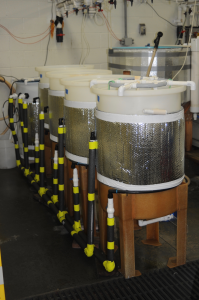 Temperature controlled tanks for raising the young Olympia oysters in the MLML aquarium room. Clam shells suspended in the tanks that serves as the substrate for the Olympia oyster young. 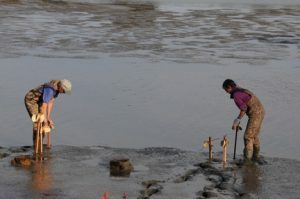 Kirsten Wasson (on right) and helpers place new array of clams and oysters attached into mudflats of Elkhorn Slough.